In a time when hip-hop artists heavily sample instrumentals, this four-piece band has attracted a number of rappers and hip-hop artists. The band will perform at the Showbox on Thursday, Dec. 14. BADBADNOTGOOD set itself apart as a band of pure instrumentalists who let the jazz philosophy of music bending to individual musicians’ styles shape their genre-hopping evolution. Using bass, keys, a saxophone and drums, the Ontario quartet — Matthew Tavares, Chester Hansen, Leland Whitty and Alexander Sowinski — have created a world of music that’s the opposite of static. The band will be performing at the Showbox, Thursday, Dec. 14. Their sound is distinct and catchy, dense with layers. “I have no idea how to even describe our music, I wouldn’t even call it jazz,” says bassistHansen. In a time when hip-hop artists heavily sample instrumentals, the four-piece band has attracted a number of rappers and hip-hop artists. They’ve collaborated with Tyler, the Creator and with Kendrick Lamar on a track in his critically acclaimed album “DAMN.” They’ve even worked alongside legends like Ghostface Killah from Wu-Tang Clan. The band first became noticed for its instrumental covers of hip-hop music. In its fourth album, titled “ IV,” you can hear some of those influences with the simple melodies and drums that highlight the rhythm and beat. While you may find BADBADNOTGOOD albums in the jazz or hip-hop section of a record store, Hansen is weary of identifying as either. In working and collaborating with artists in the studio, Hansen says the band can change and fluctuate their style to complement whomever they’re working with, which may be why so many artists have been drawn to working with them. “We’re really malleable, like if we’re in the studio with Mick Jenkins, we can play any influence he’s bringing, we can play around with that,” Hansen says. 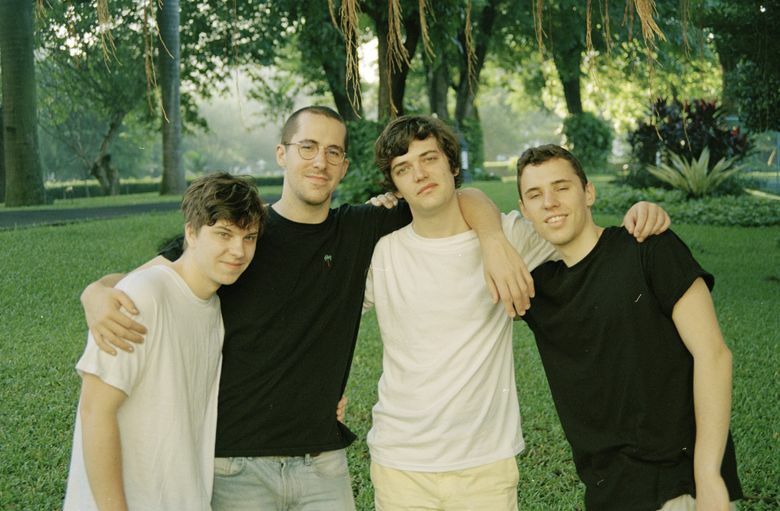 BADBADNOTGOOD’s music becomes a complementary way of propelling the voice and perspectives of the artists the band works with or who sample the band’s tracks. Take for example, “Lavender.” The synth bass is heavy, reminiscent of old-school gangster rap. Perhaps that’s why Snoop Dogg recently sampled it for his controversial single of the same name that takes on police brutality and President Donald Trump; the video of the song features Snoop Dogg firing a toy gun at a clown that looks strikingly similar to Trump. “It’s interesting for us because we didn’t intend for the song to turn out like that, but we’re obviously thrilled that Snoop Dogg wanted to do something with it,” Hansen said. Hansen says that while their music changes as different artists they work with influence it, they still want their music to express their personal sound.